Celebrate Guy Fawkes in Glasgow Green, with Glasgow’s infamous and spectacular musical fireworks display. The Guy Fawkes (or Bonfire Night) celebrations in Glasgow Green are back for another year on the 5th of November 2017. The Glasgow fireworks show offers a free, safe and family oriented evening of fun. There will be a funfair and onsite catering, which will be available from 5pm with the fireworks starting at 7.30pm. Don’t miss one of the greatest events in Glasgow’s calendar! 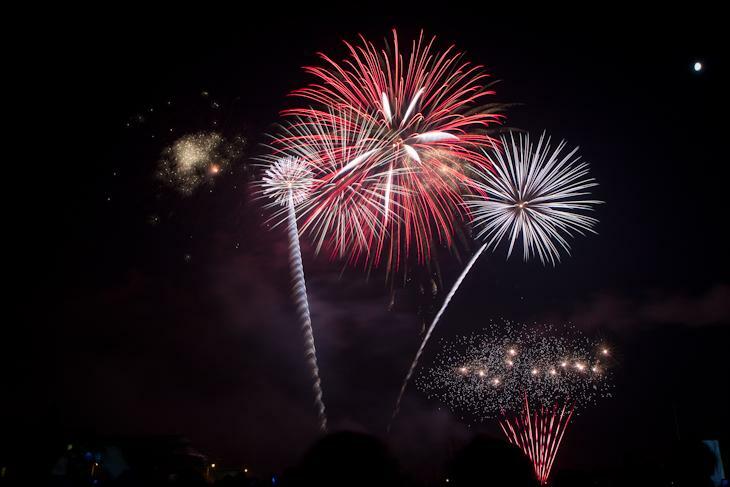 The night is not just about fireworks though; there will be pre-show music and fun (details still to be confirmed, but usually this is from 6.30pm hosted by local radio stars), a funfair and food and drink stalls. Enough to make sure that everyone is entertained! This year’s theme hasn’t been announced yet, but the event will be sponsored by AG Barr. Even though in Glasgow we love to call the 5th “bonfire night”, there is no bonfire at Glasgow Green. You should enter Glasgow Green from the west end of the park, any entrance on the Saltmarket or Greendyke Street is suitable as the other sides will have no public entry. Entry is free, and it is usually very busy. Last year more than 50,000 people turned up to watch the fireworks at Glasgow Green! If you want to be a the front, you will need to get there early, though you get a good view from most of the park, just look up! Road Closures – If your driving on the 4th please be aware of road closures on Greendyke Street, Charlotte Street, Montieth Row and Montieth Place. These roads will be closed to vehicles between 4pm and 9pm. Access via St Andrew’s Bridge and the River Walkway will be closed from 5pm on 4th November and will not re-open until 8am on 5th November. Do not bring fireworks, sparklers, alcohol or pets to the Glasgow Green fireworks. Dress appropriately – We live in Glasgow and there is always a good chance we will get rubbish weather! Like all outdoor events, the weather may cause the event to be postponed or cancelled. We will keep you as updated as we can! looking forward to the night taking my nephue to c the fireworks. Had a great time tonight at the firework display !!! WHY IS GLASGOW SPENDING THOUSANDS COMMEMORATING AN ENGLISH HISTORICAL EVENT. Why are you such a bore Willie? The 5th of November has really nothing do with Guy Fawkes anymore and it’s been that way for a long time. It’s night when we all go outside and let of some fireworks – that’s it. And the people of Glasgow seem to love it, turning out in their tens of thousands each year despite the weather! The chap Guy Fawkes was trying to blow up was James VI of Scotland as well. Indeed, Fawkes had denounced James, Scotland and his Scottish entourage to the Court of Philip of Spain in an attempt to gain aid for a general Catholic rebellion in England. Given the religious politics of the time the plots defeat was welcomed generally in Lowland Scotland and in particular in Glasgow which appears to have been a staunchly protestant town at the time. The night has certainly been commerated here for more than 300 years. Why doesn’t Glasgow Green have a bonfire along with the fireworks which you would expect given that it is Guy Fawkes night? I was in Leeds in 2010 and they had a bonfire in Hyde Park and it was brilliant. This years display was one of the best yet, very well organised and a great way to celebrate bonfire night! Hopefully it is as good next year! Great display, could have done with less music but for me a great revisit of my childhood, came back from Ireland to see it well worth the visit. Nicely done! It was really astonishing fireworks 🙂 I’ve never seen something like this before even i live in a such a big city in Czech Rep. I can’t just imagine how much cost the event like this..
Just come back from this years fireworks show. was good, but certainly nothing close to 50,000 explosions. closer to 500. with music so loud you couldn’t hear and of the whistles or bangs. the night would have been infinitely better with the music turned down for the show. how’s the entrance from bridgeton train station? planning on getting the low level to there, is the park entrance via West Brewery going to be open? Should be a Great Nite , it has been the last couple of years. Take my young daughter to it. The only thing to beware are the Young Fekin Idiots running about after the display and in the fairground fighting and throwing rockets indiscriminately. So if you see someone Booting a Hoodie up the Arse it will probably be me.